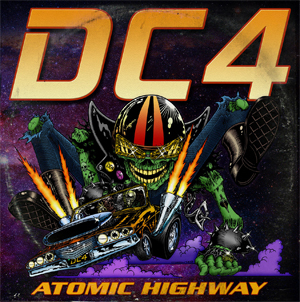 Atomic Highway, the new release from L.A. mega rock band DC4 featuring Jeff Duncan (ARMORED SAINT, ODIN), Rowan Robertson (DIO, BANG TANGO, RAIDING THE ROCK VAULT), Shawn Duncan (ODIN KILLER BEE), and Matt Duncan is set for September 14th on HighVolMusic. Atomic Highway contains 10 tracks of epic hard rock and also features John Bush (ARMORED SAINT) and Dizzy Reed (GUNS N' ROSES, HOOKERS N' BLOW) on THE WHO cover "Baba O'Riley". Atomic Highway was recorded, engineered, and mixed by Bill Metoyer at Skull Seven Productions.